1. I kicked off June with a trip to A-Kon! 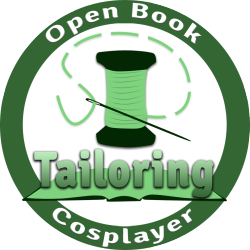 This convention is near and dear to me, since it marks my 3rd year of cosplay and attending conventions. Overall, I had a blast, and this was definitely my best experience yet! I got some beautiful shots back from various A-Kon shoots. One of my favorites is this Captain Marvel profile from Kristi Grunden photography. 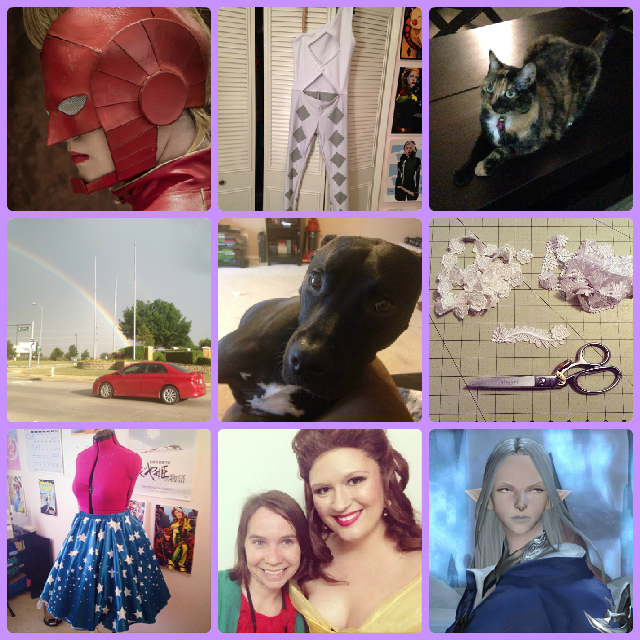 You can find more photos of my A-Kon experience on my Facebook Page. 2. As I mentioned in my last WIP post, I wrapped up a couple of commissions this month. I was pretty pleased with how both of them turned out, especially Ghrihahim. It’s one of the craziest bodysuits I’ve made to date! 3. I did some cat-sitting for Callula Cosplay while she was out and about on world travels. Her cat Bella is so adorable! As much as I love Thor pup, I’ll always be a crazy cat lady at heart. 4. My boyfriend’s dad visited us a few weeks ago. We trekked out to see the Rangers vs. Twins baseball game. The game got delayed by rain, but we did see a very neat double rainbow! 5. Thor. Because Thor. He’s taken to chewing up his dog beds recently, so we’re taking him on even more walks in an effort to tire him out. My co-worker also just recommended a bed we’ll look into if he destroys his current bed. Have any of you had this kind of issue? 6. I’m making small bits of progress here and there on Lulu! Part of me wants to push all of my other projects to the side and just knock this out. I’ve put this costume off since I started cosplaying 3 years ago, and I’ve made it a monumental beast in my head. I think I’ll feel better once I really dive into it. 7. I had my first live-stream experience at the end of June! I was unsure how it’d go, since I’ve only seen a few and never done something like this before. It was pretty cool to just chat while doing some simple crafting. I wouldn’t mind doing something like this again soon! 8. My friend Allison invited me out to her library as Belle for their summer reading program! They had a storybook/Disney theme with lots of interactive crafts and I was in my own section with a castle backdrop. Hopefully I’ll have more photos to share soon! 9. I spent a ridiculous amount of time playing FFXIV this month since Heavensward dropped. My boyfriend and I took an entire 3 day weekend to chill and play video games and it was glorious. I’m leisurely leveling my White Mage and Astrologian, and I’m really enjoying my new flying mounts. Though all this game play has me thinking I may have to make a cosplay from the game soonish. Ysele is a strong contender (and much easier than her Shiva counterpart :P)! Thor is adorable. And I can’t wait to see your Wonder Woman all finished! Also I nominated you for a blogging award! Previous Previous post: Etsy Shop is Live!